Planting up a building wall can result in a charismatic feature, as the vertical gardens for One Central Park in Sydney demonstrate. However, installing a vertical garden calls for a different approach to growing, selecting and maintaining plants than traditional horizontal landscapes. A lot of consideration also needs to be given to the structure that will be holding the plants. Your structure needs to be lightweight, very strong and have some flexibility and malleability. French botanist Dr. Patrick Blanc popularised the vertical garden concept. He applied technical insight to develop a growing medium that’s compatible with building technology yet physically separate from the structure, even though plants appear to grow from it. Blanc refers to the lush, forested effect of his gardens as a “living tapestry.” The textured, often artistic, result is achieved with careful selection of plant species for hardiness and tolerance, planted in generous quantities. Plants will naturally grow vertically in nature on the sides of cliffs and tree trunks without soil, as long as they have access to light, carbon dioxide, water and nutrients. For man-made vertical gardens, a hydroponic system is used to deliver water and nutrients to the plants mechanically. Plant roots draw these nutrients from a mesh-covered felt material, continuously replenished from a water source. The plants need to be separated from the wall, usually with a light metal frame structure, which will protect the wall from water damage and other negative impacts associated with such proximity. The design and construction of these metal frameworks is one of the areas we specialise in at Tensile. 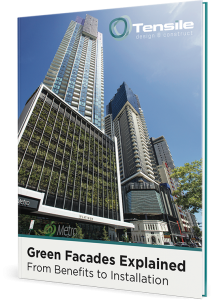 We collaborate with engineers and building designers to design elaborate wire frames called a green façade. A lot of detail is taken into consideration when we plan facades, including comprehensive research into the effect of wind on plants at high elevations. Planting for species diversity is a key strategy for ensuring long-term vigour of the vertical garden. Variation in leaf size, flowering and growing habits also enriches the textural quality of the design, contributing to the coveted tapestry effect. Diversity protects the garden from large-scale losses to diseases or pests, so that unsightly gaps can be avoided if less resilient species perish. Environmental conditions change from the ground level to the top of a building, with dry and windy conditions intensifying at higher elevations. Plants that can withstand sun and wind should be chosen for the higher portion of the wall, sheltering more delicate species that need shade and more hydration on the lower levels. Indigenous plants are reliable and adapted to the local climate, but exotics are sometimes mixed with native species for variety in colour or another special attribute. Many maintenance tasks for vertical gardens are similar to horizontal gardens, such as pruning and clearing debris. However, vertical gardens are particularly vulnerable to disruptions in the water supply. Monitoring the irrigation system is one of the most critical aspects of maintaining the plants in a green facade. The height of the garden also presents a challenge for access when the structures are tall. Hydroponic systems are incorporated into the façade design during the planning process, so they can supply plants with the water they need, yet remain visually hidden and sheltered from the elements for longevity. Contracting the services of a specialist in vertical garden maintenance is often part of the long-term operations and maintenance strategy for a development, especially when the features are significant assets to the project. Interested in installing a vertical garden for one of your projects? Contact us here.